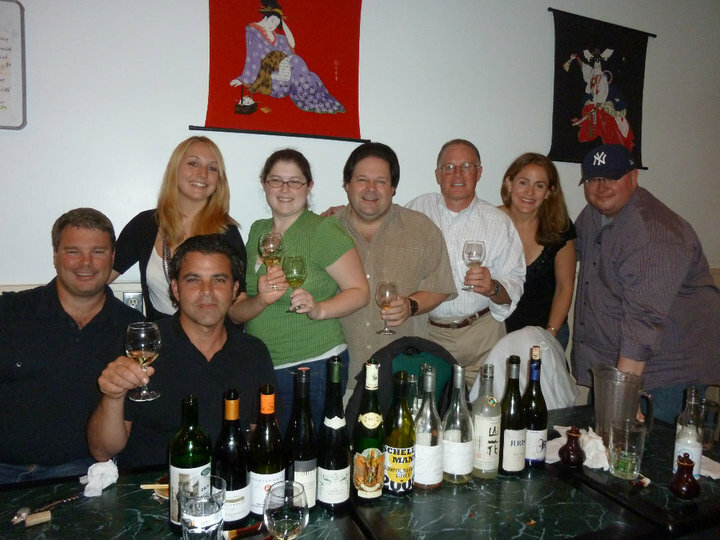 Last night boss Steve Raye and I met with Richard Auffrey of Passionate Foodie, Amanda Maynard of Wineing Woman, Adam Japko of Wine-Zag.com, Thadd & Alice Palmer of All Set in Massachusetts and Dale Cruse of Drinks Are on Me at a delightful B.Y.O.B. Japanese/sushi restaurant in Stoneham, MA called Kyotoya. It didn’t take long for the ice to break – jokes were being made at each others expense, legal advice was given, marriage proposals were being thrown around and next thing we knew a boat of sushi, a plate of maki, a plethora of appetizers and a bento box for Amanda were ordered and the Gemischter Satz, Gruener Veltliner, Pinot Noir, Rotgipfler, St Laurent and Zierfandler were flowing. Dale also brought a bottle of 2005 Sauternes and Adam brought two bottle of Loomis vineyard from California, a Grenache Blanc and a rose. That’s a lot of wine for only 8 people! Luckily there were some real troopers in the group who graciously volunteered to polish off a couple bottles and take those home they weren’t able.